Essentially, this latest Trucks signature is an old-school SG Standard. Nothing wrong with that at all! Nails the Trucks tone. Iconic looks still appeal. Great for slide or regular use. Build issues that you won't find on rival brands at a similar price. All that's left of the Deluxe Vibrola - this is a hardtail guitar! Derek Trucks' Signature SG is apparently based on his trusty '61, complete with just the engraved Lyre tailpiece of the disabled Deluxe Vibrola. Now, guitar historians would tell us that technically this vibrato didn't appear until 1963, and the guitar was still called a Les Paul Standard until 1963, despite the more-than obvious difference between what we all now refer to as the SG, and the prior Les Paul. "The Trucks is a perfect picture of a guitar we've probably all dreamed of owning, whether we're Trucks fans or not"
With its slightly faded-looking Vintage Red gloss-nitro finish, the Trucks is a perfect picture of a guitar we've probably all dreamed of owning, whether we're Trucks fans or not. It avoids any obvious signature guitar-isms, aside from the (easily swapped) 'Derek Trucks' truss rod cover. Gibson's production consistency still falls a little short of most other premium USA-made brands - the finish, for example, is noticeably mottled, yet that in itself adds to a slightly vintage, less modern-precision vibe. And although Gibson is now, on certain models, putting its fret ends over the fingerboard-edge binding, here, it's old school: the plastic still forms the fret end, with plenty of potential for a gap to open up and for your top string to slip into it. Gibson uses the Plek machine set-up, too, yet the frets here are hardly mirror shiny; there was a little buzz on the higher top-string positions also, and the rosewood 'board looks dry and pale in colour. Finally, the Trucks model opts for dual '57 Classic pickups, a smaller ABR-1 Tune-o-matic (without the retaining wire) bridge, Tone Pros vintage-like Kluson Deluxe tuners and period-accurate silver- topped knobs. 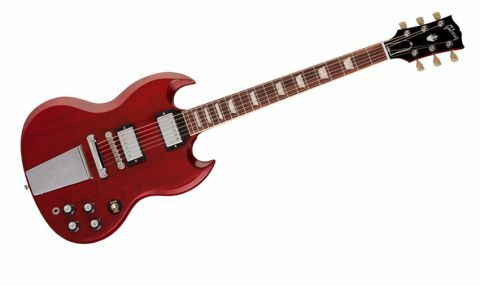 The SG has long been recognised as a near-perfect electric slide guitar, not least in the way the neck sticks out and especially with the really easy access to the full 'board. Trucks uses a hybrid medium/heavy string gauge, and what he describes as a string height that's just high enough for clean slide, which he predominantly tunes to open E.
Gibson ships the guitar with a normal, non-slide playing action and 0.010-0.046 strings. But all you need to do is swap the top two strings for an 0.011 and 0.014 and, via the thumb wheels, raise the bridge, tune to E and get out that glass slide. Of course, there's absolutely no reason why you have to use the guitar like Mr Trucks. A standard action results in a simply fine classic rock/blues solidbody. "Certainly, on the neck pickup, it nails that Trucks-esque, fat, liquid tone"
There's vintage-like low power, and quite an edge to the bridge played clean; the neck is a little hotter, with a nice round nose, but still some articulation. Into light-gain territory, and that almost generic Gibson all-mahogany tone appears, a little narrower than a maple-topped Les Paul and more focused. Certainly, on the neck pickup, it nails that Trucks-esque, fat, liquid tone. With both pickups on, you have all the subtle shades, and it's easy to dial in a darker 'woman tone'; if you want more bite, the bridge pickup just about stays on the right side of shrill. If it ain't broke... Well, the Derek Trucks signature model is pretty much the only 'standard' SG in the current 2014 line up. It's a classic guitar, no question, but there's some serious US-built competition out there and arguably its main appeal lies in its heritage, not necessarily its sounds or build quality.